The opera is based on the biblical Book of Tobit, featuring the stories of Tobias and the Angel, the marriage of Tobias and Sarah and the restoring of blind Tobit’s sight. The story is set during the Babylonian Exile, and explores experiences of religious and racial persecution and diaspora, of generation gaps and familial tensions, of friendship and love. A racy and hilarious piece of folk-drama, depicting the rawness and beauty of political, financial and spiritual life; in which the forces of angels, humans and dogs are pitted against the malign forces of demons, sparrows and fish; a tale of blindness and healing insight, the opening of all the senses, of the reward of virtue, the Providence of God, and the true fulfilment of young love. This kind of story-form seems a characteristically Jewish method of teaching, but is as immediate and powerful now for all listeners as ever it was. In a world which seems to have an increasing unease in dealing with questions of spiritual life and death, in which spirituality is laid down as a core concern for schoolchildren, but where teachers can feel extremely uncomfortable carrying out the objective, The Book of Tobit suggests an ancient but nonetheless effective way of addressing the matter. The impulse to create a new church opera originated in the parish of St Matthew's, Perry Beeches, Birmingham as part of an overall artistic policy for the parish, including the commissioning of new works of art, initiated by Father Simon Mackenzie. It was from the beginning designed as a collaboration between professional and amateur forces, on a scale very carefully judged - not so enormous that it required a long-term commitment of the entire community, but substantial enough to make it a satisfying achievement - and although written with St Matthew's (a modern church, a listed building from the sixties) in mind, flexible enough to be performed in many kinds of spaces. Our general aim was two-fold: to identify and nurture a network of local people who are interested in arts activities and willing to further them, and to create a work of art that is within the capacity of any such community to recreate, an inspiration to others. 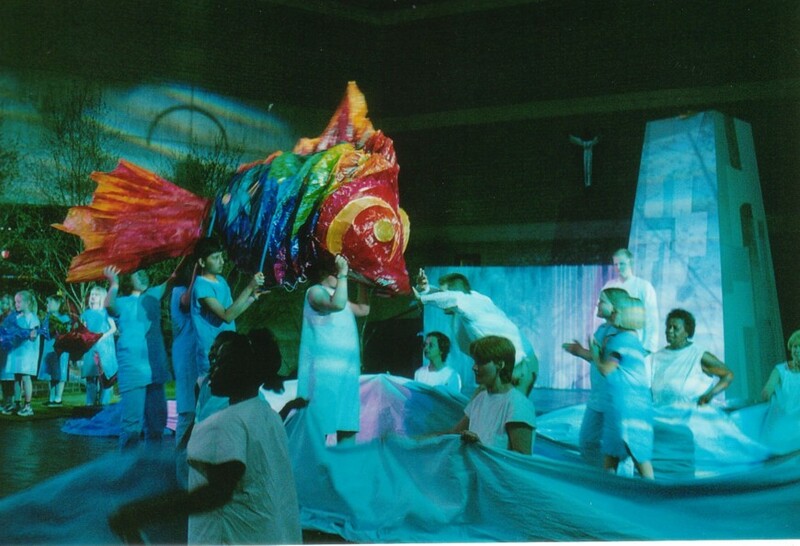 Specifically, we planned a programme of workshops for children and adults, not only as part of the rehearsal process leading to a production of the opera in the early summer of 2000, but as part of a wider aim to encourage interest and participation in potential future events, and to bring in new audiences. The idea originated from within a circle of friends: a vicar, a church musician, a writer on opera, and an opera director, pursuing very different careers, yet sharing a deep conviction of the power of music and the theatre to touch people regardless of education, culture, or class. It was supported and furthered by an astonishing number of people: composers, writers, people within professional artistic organisations and within local community ones, and we were very aware of the personal commitment given by everybody involved. It was of extreme importance to us that this feeling of personal involvement and responsibility should extend to everybody concerned with the opera, from the performers themselves to the schoolchildren doing associated project, that the guiding principle remained that of individuals working together to share skills and inspirations: to practise, as Tobit, Tobias and Sara do, to see, to listen, to feel - and to make music. The project was initially devised as a community venture for Perry Beeches in association with the City of Birmingham Touring Opera (now City of Birmingham Opera) but was taken up by Almeida Opera in London as well. This meant that the opera was given two productions, in 1999 and 2000, that saw it produced by the Almeida on a more or less fully professional level in London before going into the extended Birmingham community workshop programme. This was an extraordinarily interesting and exciting course of events that proved the piece to be flexible and wideranging enough to appeal to people interested in serious modern opera as well as continuing to be accessible to community groups. In other words, a real successor to the perennially popular Britten church operas. St Matthew’s is an extraordinary church in an outer urban area of North Birmingham. Built in the 60’s, it has won architectural prizes for its subtle yet accessible design, and under the guidance of its present incumbent, Father Simon Mackenzie, it is becoming a spiritual centre not only in a conventional ecclesiastical sense but in other ways as well. Father Mackenzie’s initial venture was to commission a new series of the Stations of the Cross from Nicholas Mynheer. The making and installing of these became a very important development for the parish and for many people outside it as well - there were programmes of linked schools activities and also of associated musical events. 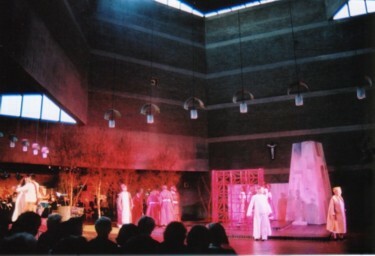 The Birmingham Contemporary Music Group, perhaps the foremost ensemble in the country for the performance of new music, discovered the excellent acoustic in the church, and have put on several important concerts there, including the church in their outreach programmes, and using it as a venue for, among other things, liturgical performances of 20th century Mass settings.